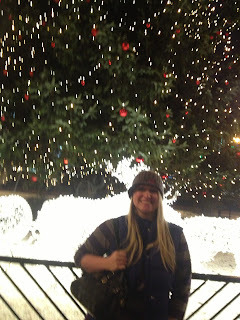 Transatlantic Blonde: What I Wore Wednesday: Nativity, London & Santa Oh My! What I Wore Wednesday: Nativity, London & Santa Oh My! Where has the year gone??!?! I made a folder for work called "Week 51" on Monday--how are there only two weeks left n the year? It's all flown by so fast and I know I'll blink and Christmas will be here. On Friday Blondie Boy had his first Nativity Play at school; I wasn't sure what it was going to be like but it was just kids dressed up singing Christmas songs so my "separation of church and state" issues didn't really matter. Blondie Boy was a shepherd. Yup. He was happy, well behaved and cute but he didn't sing. He just stuck his tongue out. Stuck it straight out, to the left, to the right--anyway you can stick your tongue out he did it. He's obviously the next superstar.To be fair to him there are many stories of myself at age 3 showing my Mom and Dad my ballet recital routine over and over and when the actual recital came I stood there with my fingers in my mouth. I got over my stage fright so I'm sure he will too. Here he is actually singing Rudolph though just so you know he can actually do it. I love that he says "very nice shiny nose" and "like toothpaste." I have no idea why we said that for the history part growing up but I promise you we did even though NotBlondeHusband hates it because toothpaste can't be of a historical nature--whatever it's funny. As soon as the play was over we had to high tail it home to grab our suitcases and head to the airport and visit NBH's sister for the weekend. Blondie Boy was super excited to visit London (he's only flown through before) and see his Auntie Katie. We went to the Winter Wonderland in Hyde Park but most exciting we accidentally came across Santa at the South Bank Christmas Market! Now tell me that's not Santa! Santa was very lovely and Blondie Boy was pretty star struck but managed to count out on his fingers for Santa which cars he wanted. Now if you don't believe explain this--after telling Santa what he wanted NBH and I found said cars that we've been searching for for months at Tesco in Clapham. I believe! We had a great weekend and we've come back and it's still go, go, go! My outfit this week is from Monday. I was chairing a fundraising meeting for Glasgow Women's Aid and then went to get my eyebrows done. My salon is in the centre of town so I got to walk through George Square and the Christmas lights to get from my car to the salon. The sun goes down around 3:30pm now and once it's down you need a hat on! I liked this zipper details on sides of the bottom of this dress but the dress itself is pretty shapeless so I have to wear the vest over the top. Also it is freaking freezing and you need a coat--to be honest I should have worn a full coat but I love my vest! I'm not sure if maybe a belt would help the dress? I'm a bit scared of belts if I'm honest. The dress is basically sort of sack of potato like around the middle if you know what I mean! So we're 6 sleeps until Christmas and we don't even have a tree yet since things have been so hectic! If you celebrate Christmas are you ready? Also I feel I need to say that I don't feel it is my place to say anything about the horrible events last Friday; I'm very clear in my own thoughts on gun control and the 2nd amendment even more so than ever after such a horrible tragedy. I urge you all to please sign this WhiteHouse.gov petition for legislation on gun control in the USA. That's so fun that you ran into Santa! I love your outfit as usual, I'm loving stripes lately! I wish my son's school did a nativity play. Thats cool. He looks so cute! I just love kids Christmas pageants, spent the last two nights watching my 3 oldest perform. OMG Blondie Boy is so adorable and what an awesome pic with Santa. Your little blonde shepherd is such a cutie! Hope we meet Santa Claus soon as well. Happy Holidays to you and your lovely family. Lil guy is such a CUTE lil shepherd...enjoy the holidays! 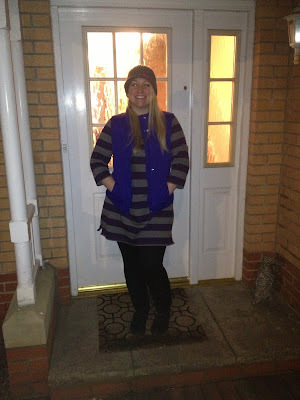 I styled a puffer vest this week too! Vest + stripes + leggings made the perfect outfit! oh my goodness, cutest shepherd ever! I still love that puffy vest. I've had my tree up for a few weeks, but it wasn't without drama. I had a 3 hour window that was my only free time on the weekend this month. You can imagine that the Scot LOVED the ush to get the Christmas tree up at 8 am on a Saturday. My favorite event of the year is my daughter's Christmas program--the chaos and unexpectedness of it all is so entertaining. And that vest again! Ahhhh. Three things I love from this post: 1. You adorable son! My first Christmas recital, I got the giggles! (Sigh) 2. I smiled at your use of "6 sleeps," which reminded me of a friend from Canada -- whose mother is from Scotland -- who also uses this phrase! 3. And your shout-out and link to sign the petition for legislation on gun control. Thank you. Wow - he is adorable and the pic with Santa is great! Have the happiest of holidays and God Bless you and the family! Your boy is the cutest shepherd I have ever seen. Such a cutie pie! My little guy did the same thing (he was a shepherd too) and sat in his seat and never sang a word. ;) Too funny. Love that hat on you! I put the link up badge in my sidebar! What a cute little shepherd! London at Christmas looks fun! I don't make a bit deal of decorating for the holidays but I love getting together with friends and family. Have a great one! Your little guy is so cute!! Really liked the Santa too! The markets are definitely WAY bigger and WAY better than in Glasgow! Aw thank you! Grabbed it for £10 at the outlets lol. I know right? He was so nice and jolly as well. Proper amazing Santa! Lol a tree closet---love it! Aw thanks Rachel. I couldn't believe we found them in a friggin Tesco Metro! He was so star struck! Isn't it an awesome Santa? I know it's so random lol. The "6 sleeps" thing is something I've definitely picked up here! I'm extremely anti-gun and things need to change back home. Enough is enough. I know I'm kinda obsessed with the vest! We STILL don't have one. I'm currently trying to see if anywhere in Glasgow still has any. I feel like in the US there'd still be tons! It was the best Santa EVER! I know! Our normal Santa place wasn't open this year so I'm so glad we saw an awesome Santa randomly!